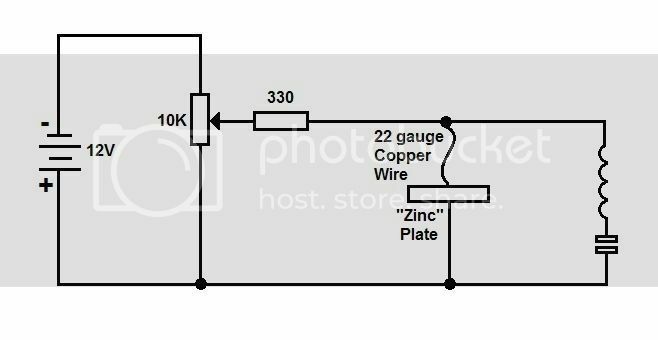 Anybody ever make a tunnel diode type amplifier for radio frequency? 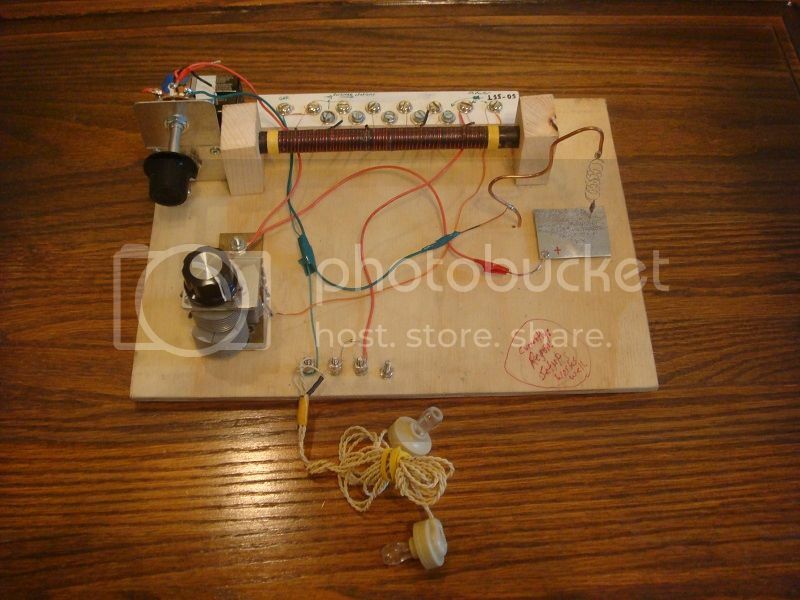 This is a homemade tunnel diode amplifying device that works well for radio frequencies well into the higher frequencies, but apparently can also do audio to some extent. (The metal working, of course, was done outside and with appropriate protection from heat, sparks, and fumes. Zinc fumes, I have read, are not good to breath.) I found the piece that worked best was a strip of galvanized sheet steel that was scorched pretty fast in a hot flame until white hot sparks were jumping, and quenched in water while still red hot. The catswhisker is just a piece or 22 gauge copper wire cut at an angle for a semi-sharp point. I pressed that point through a small disk of plastic so it stuck through about 1/8", and put some Duct Seal on the back of the disc for a little weight. This way I can pick up the whisker by its little connector wire (a single copper strand from and old stranded lamp cord) and set the tip in different places--or drag it gently--until I got a bit of oscillation on the scope (more than the damped wave you get when it makes and breaks contact). Then the potentiometer was adjusted for stable oscillation. I changed the power supply slightly from Mr. Steiner's design to give more current control. I had no luck with the website's exact power supply design. By the way, I found Steiner's zinc detector diodes both easy to make (much easier than the oscillator) and excellent performers. Checking for gain by putting it in self oscillation at about 1.4 MHz. I used an AM broadcast band radio receiver to zero beat, and could pick up the radiation from this unit for as far as a bothered to carry the receiver. Later I made a new one with different metals and a more refined holder. I wanted to see how well this could amplify a modulated RF signal, so I set turned the voltage on this one just below the oscillation point and injected a tone modulated signal from the signal generator which was tuned to the same frequency as the resonant circuit, and played with the voltage level potentiometer a bit. I also cut the power and looked ate the signal output with the ZNO device both in circuit and bypassed. The scope clearly showed an increase of several times the input signal level when the batteries were connected. I can see where this really could give a big signal boost to a crystal radio receiver. 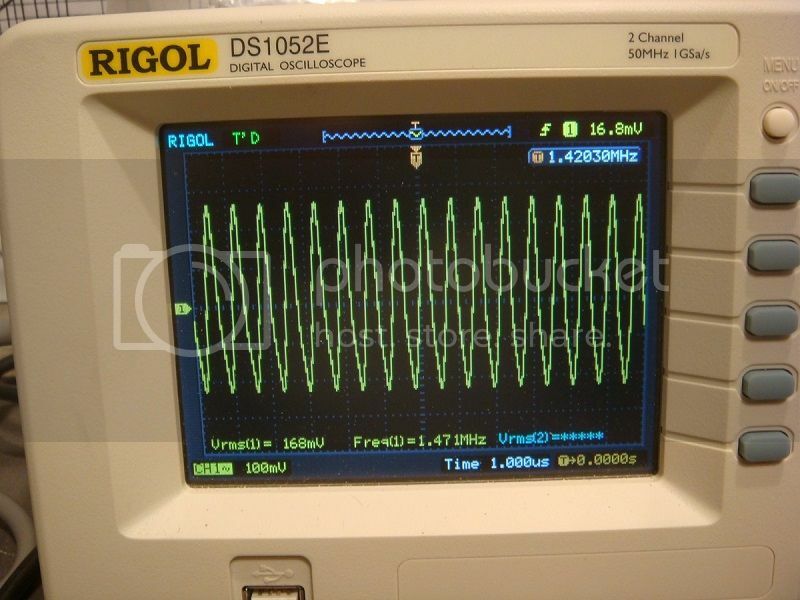 In this picture it is running as just an oscillator, but quite strongly, at approximately 6-8 VPP and 800 kHz. I forgot to add that later still, I did try it successfully as an RF preamplifier for my crystal receiver. 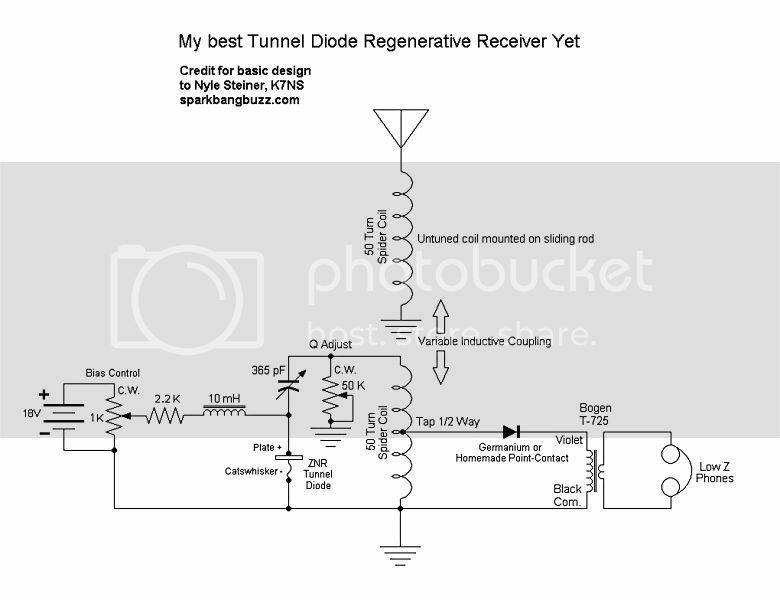 Re: Anybody ever make a tunnel diode type amplifier for radio frequency? Looking at that bottle of tummy medicine and looking for the spoon and burner? Cool! I wonder if this can be done with Bismuth? I do believe other materials can work, because of some of the curves I have seen while experimenting with homebrew radio detector diodes, but I have no reason to think bismuth would or would not work. I believe the key here with the zinc plated sheet metal is that in heating it, the zinc oxide that forms becomes doped with a small amount of iron and manganese. Rolled steel typically has some manganese in it for strength. Many years ago, around the late 60s, there was an ~100Mhz oscillator produced with a Cadmium Sulphide crystal. It used a tuned circuit and a low voltage bias supply. Sadly I cannot remember the details how it was configured/constructed. It certainly radiated and could be picked up by an FM tuner of the day. I think it may have been modulated to produce a relatively crude FM signal. It could be another possibility for experimentation. That would be a good material to experiment with. I have read that many negative differential resistance materials have been discovered in recent decades. I guess before that, not many people were even looking for them. That's quite beautiful, like a 19th century scientist's setup for investigating the nature of the universe. Awesome. Just wondering if the 330 ohm resistor wouldn't be better replaced by an inductor to reduce the loading on the tuned circuit? Or does the diode swamp this loading anyway? BIG bismuth crystals are super cheap on ebay. +1, looks awesome, not entirely dissimilar to the first transistor. 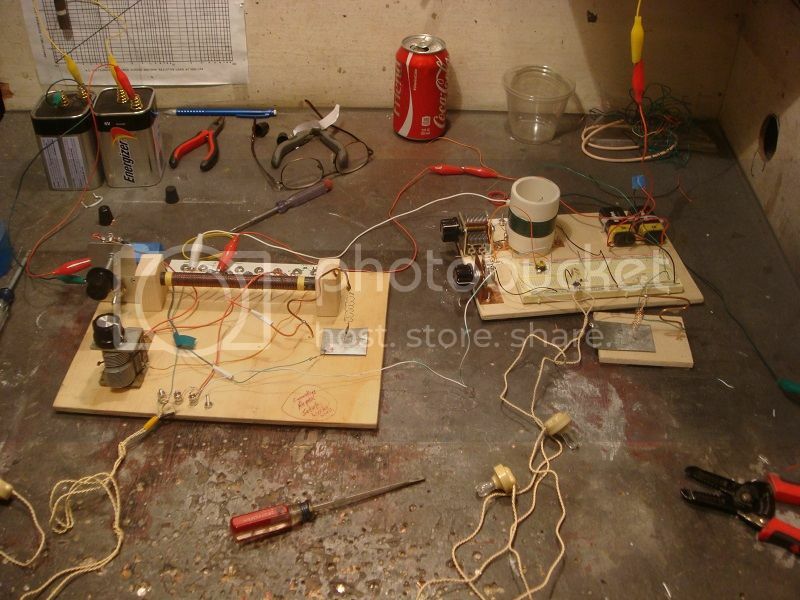 Thank you...I built the holder for a point contact transistor experiment, originally. 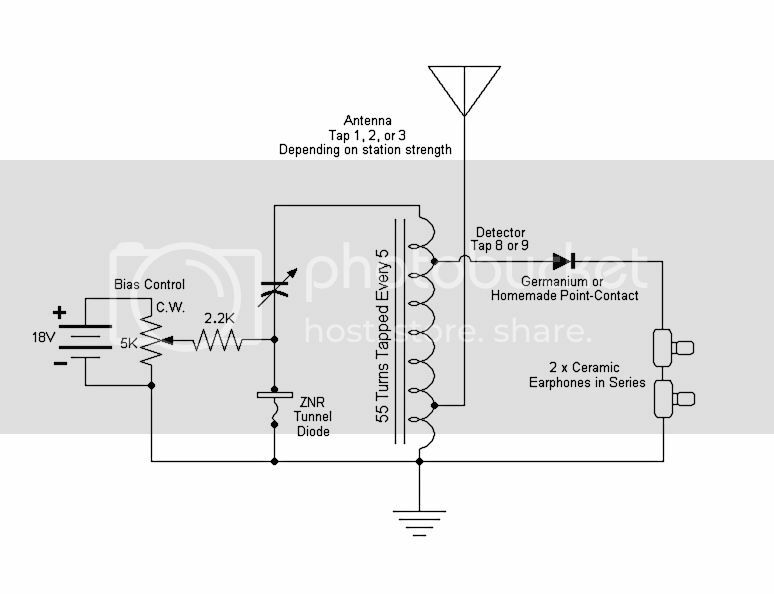 I have not succeeded in that, so far, but it works well for this amplifier setup or for an adjustable crystal holder for a crystal radio receiver. You are correct that an RF choke is better than a resistor for using this unit as an amplifier. 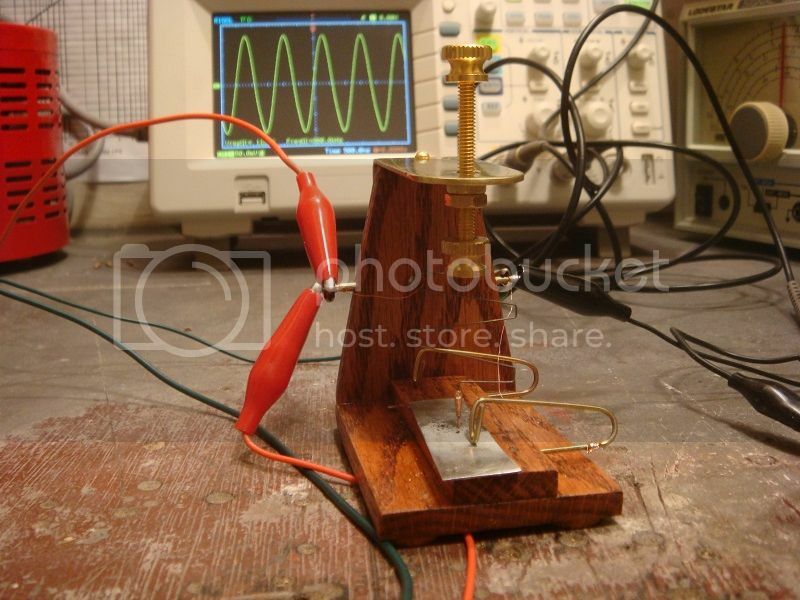 For a simple oscillator, it doesn't matter much, though you might get more power out. As an aside, it is possible to matrix a number of tunnel diodes to get more power, too, but it would take some patience to get several of these homebrew versions together and adjusted properly....but it is possible. This test setup is my regenerative receiver for the AM broadcast band. Properly adjusted, the signal gain was impressive. I could have used a homemade detector too, but I didn't want to have two point contacts to adjust. There are definitely spots on the oxidized metal plate of the negative resistance device that work better than others--both in current gain and in the smoothness of its characteristic current/voltage curve. Some areas either cause oscillation or are dead, while other spots go smoothly from oscillating to maximum regenerative signal gain by adjusting the bias potentiometer. I also found that the best coil tap for the antenna depends on station strength. For weak or distant radio stations that are difficult to read, moving the antenna tap up the coil (further from ground) works best at boosting them to an understandable voice level. The regeneration action really helps with station selectivity, too. This is a nifty thread! Can't wait to get home to read it in detail & start experimenting . . .
That circuit has the minor disadvantage that the tuning cap chassis is 'hot'. Unfortunately one wants the battery to be earthy as well, and the alternative of inserting the ZNR diode at the earthy end of the coil causes problems for the detector, unless you either use a voltage doubling charge pump (absolute joy - THREE cat's whiskers to adjust! ), or a separate coupling coil for the detector. Thanks! It is just about identical t Nyle Steiner's (sparkbangbuzz.com), so, I can't claim credit for the design. And yes, I had it that way...a 220pF and 47K across the phones, then just the 47K, then a 470K, then, nothing. It got louder and clearer every time I removed one of those things. Some phones may need the bypass cap. and/or resistors, but these (about 10K ohm impedance at 1 kHz for each one) ceramic earphones seem to work best without. I'm having fun with it. One of these days I will cascade a couple of these things for more gain, but I will have more junk to adjust...and I have to match impedances pretty well or the tunnel diode amp. won't work...more calculations. This one hasn't shown any difference in tuning or loading, actually, but I will continue to experiment by and by. Pizeoelectric ceramic earphones have a very high capacitance anyway so a shunt capacitor across them isn't beneficial. I'm surprised they dont need a shunt resistor - perhaps they already have onee or they or the detector are leaky enough to remove the need for one. I can't answer that. I know the little bypass cap is redundant, but I don't know why it works better without a resistor. Well, probably my last experiment for a while (with this ZNR stuff) lies below in the jumble of jumpers. I have to get back to my tube making trial and error (mostly error ). I wanted to figure out the right way to cascade a couple of these ZNR devices, and the easiest way was to use the ZNR tunnel diode regenerative receiver to drive the ZNR RF amplifier on a second crystal set. I had phones hooked up to monitor tuning and gain, and when the first one was working, I unloaded it and sent the signal to the second set's RF amp. Did it work? Heck yeah--the station was loud, too. Is it worth all the fiddling to get all the adjustments right? Probably only if crystal radio DXing for hours looking for that elusive "tzzt tzzt" of a very weak station and trying to make it readable. Normally I would just use the ZNR regen. alone if anything. Most of the gain seems to be there, anyway. Fun stuff, but can't compete with the convenience of transistors. ...Still, it shows it can be done--and that's not bad for scrap metal parts. Checking in...Get anywhere with it yet? I might be able to pass along some construction tips if you are having trouble getting gain/oscillation. 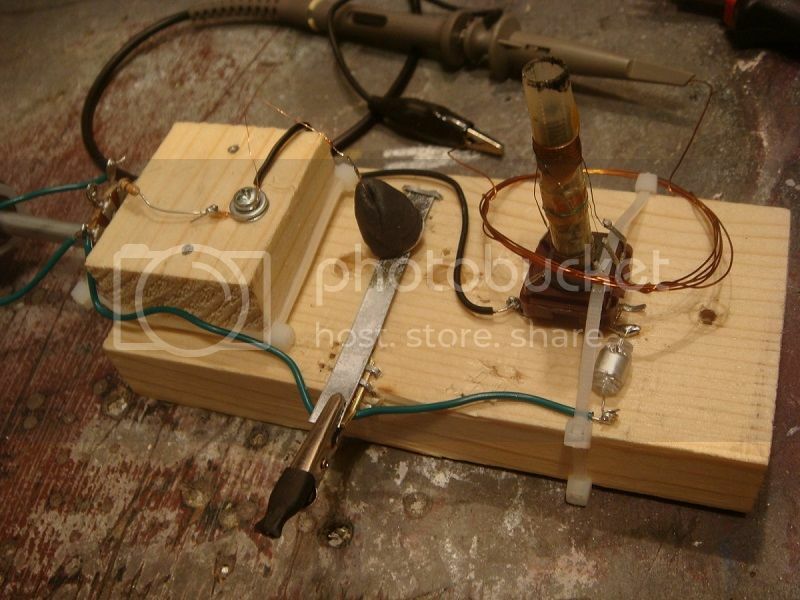 This is my best overall homebrew-amplifying--tunnel-diode regenerative receiver yet. A few modifications to the older design makes it both perform better and far easier to adjust. Additions are the Q adjust pot., the variably coupled, un-tuned antenna primary, and the 10mH choke in the variable power supply. 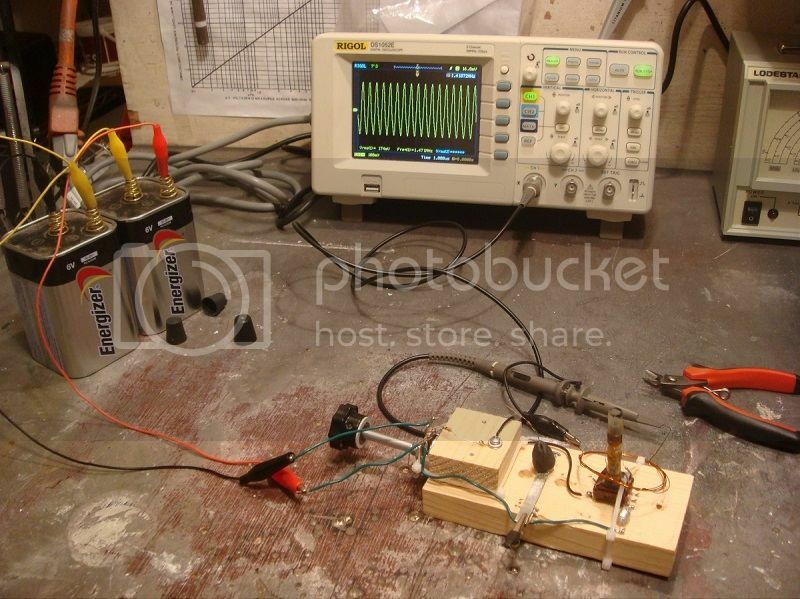 I decided, what the heck, since I have the scope hooked up across the transformer primary (secondary voltage too low to measure) and the headphones loading the secondary, let's see what it is on a weak (barely audible station) with and without the regeneration circuit. So I tuned in a station about 35 miles away that I could hear but not quite read--at least not well. Straight crystal set-up was outputting 5-7 mV RMS audio. Regen. set-up brought the station in loud and clear with 30-60 mV RMS audio. I guess 18dB average power gain isn't too shabby for a piece of scrap metal and a battery. It makes DX reception loud and clear on my crystal sets with even a so-so antenna.